I had been waiting for Tuesday 14th August with bated breath! Do you know why? Anyone who is a keen baker and a fan of the Great British Bake Off TV series will know that this is going to be the date that the first episode of Series 3 is going to be aired. I’ve been waiting for this since the finish of the previous series! I started to draft this post before the first episode was aired and realised that I would miss it! I was going to be away on holiday in Ibiza and I don’t think my family would take to it kindly if I asked to switch the telly on. I wasn’t even sure whether our villa would have British TV and usually I don’t bother watching it, it’s something I would rather do without for a week! So iPlayer it had to be and finally yesterday (Monday 20th) I got to watch episode 1 in all it’s glory. The contestants all seemed really lovely people and I really hope they all do well in the contest. Before I went away I was very excited when the postman brought me my pre-ordered copy of the latest Great British Bake Off book- How To Turn Everyday Bakes Into Showstoppers. I wasn’t disappointed. Each page brought an even more and more delicious bake, I just couldn’t wait to get started on something. At The Yorkshire Bakery we love baking cookies, in fact cookies are my first love. I just knew I had to start with an old favourite, something that makes us hark back to childhood. 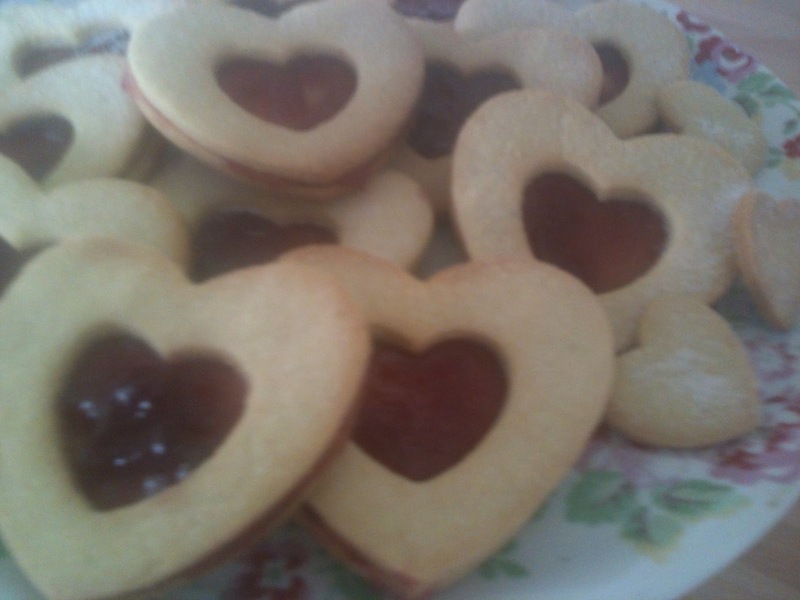 So it had to be the Love Heart Cookies (Jammy Dodgers as we all know them!). I have made these many times, particularly at Christmas with star shapes and of course for Valentine’s Day. Last year I made them with the children I work with at school in my day job as a teaching assistant. We bagged them up and the children took them home for their parents as Christmas presents. The cookie dough was simple to make in a food processor. The recipe suggested using whole almonds and crushing them up, but I only had ready ground ones spare. That saved that job. I then added the flour and sugar so it pulsed together. Once that had been done then I added cubes of cold butter as well as egg yolks. Once it began to come together I took the dough out of the processor and formed it into a ball with my hands. The dough was then wrapped in cling film and put in the fridge to firm up for about half an hour. This is important to do this as I find the dough rolls out a lot better when it is firmed up. 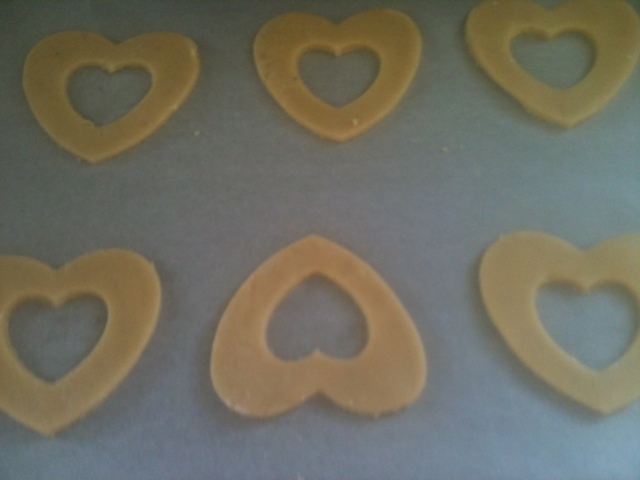 I cut 24 heart shapes out of the dough, rolling and reforming the dough carefully. Once the heart shapes were on the baking tray, I got my small heart cutter and cut a small shape out of the centre of half the shapes. I found I was left with some tiny heart shapes which you could also bake and keep for nibbles! Or if you’re like me you’ll trough them while they were still cooling on the tray. I have found it easier to cut the centres of the hearts out when they are already on the baking tray. If you do it, then transfer them, you might end up with them breaking! Once all the biscuits have cooled I thought about the filling. Now in the book the filling is made using real pureed raspberries mixed with icing sugar. I had no real raspberries to hand, having thrown the rest of the punnet on the top of my cereal this morning. I had to resort to seedless raspberry jam. The jam was carefully spread on top of the cookie so that when I put the top half on I wouldn’t have the bottom biscuit showing through. Or I didn’t want jam oozing out of the side. In the end I had a dozen gorgeous biscuits which smelled absolutely gorgeous waiting to be eaten. All they needed was a dusting of caster sugar. The first recipe baked from the Great British Bake Off- How To Turn Everyday Bakes Into Showstoppers. Love Heart Biscuits. This recipe was a brilliant one to make with children, I can thoroughly recommend it if you have kids and you are stuck for something to do one day. The tops of the biscuits laid out on the baking tray ready to go in the oven! Here are the finished biscuits!